The first steps towards the restoration of local rivers at the heart of the proposed Olympic Park in east London have been announced. 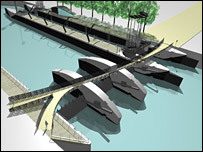 The £19m project will help large barges to use local rivers and save hundreds of lorries from making road journeys. Work will begin in March and should be completed by the summer of 2008. As well as helping barges carrying construction materials and recyclables between Stratford and the River Thames, the lock will also create new opportunities for leisure boats, water taxis, trip boats and floating restaurants. Olympics Minister Tessa Jowell said: "The restoration of the neglected waterways of the Lea Valley will be vital to achieving our commitment to make London 2012 environmentally sustainable." London Mayor Ken Livingstone has said he is determined to make the 2012 London Games the greenest ever.